J. Sargeant Reynolds Community College’s Culinary Arts Program recently received a five-year accreditation renewal for its Associate in Applied Science in Culinary Arts degree from the Accrediting Commission of the American Culinary Federation Education Foundation. The American Culinary Foundation (ACF) is the national accrediting commission for culinary and pastry education programs at postsecondary institutions and secondary programs. Accreditation by American Culinary Federation Education Foundation Accrediting Commission (ACFEFAC) assures that a program is meeting or exceeding established standards and competencies set for faculty, curriculum and student services. The College benefits from accreditation by creating public trust, ensuring established standards, accountability and credibility, a high level of professionalism and current practices. Students who graduate from Reynolds Culinary Arts Associate of Applied Science Degree Program and are American Culinary Federation (ACF) members at time of graduation are eligible for free ACF certification as a Certified Culinarian (CC). Graduated students who utilize this benefit have an advantage when seeking employment, because certification is representative of having the knowledge and skills to be successful. For more information about from Reynolds Culinary Arts AAS program please visit www.reynolds.edu. 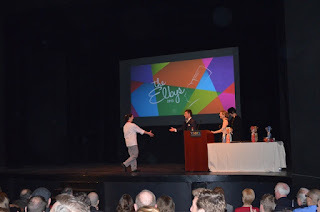 The second annual Elby Awards, sponsored by Richmond Magazine, and named for renowned French chef and Richmonder Paul Elbling, were awarded on Sunday evening, February 10, 2013, at the Virginia Museum of Fine Arts. The awards recognized winners from a list of nominees in 10 categories. Thirty industry professionals, food writers, culinary instructors and food society members nominated this year’s finalists. JSRCC Culinary Arts student Stephanie Louise Boehles was one of three finalists in the “Culinary Student of the Year” category. Approximately 400 people were in attendance at the awards ceremony. In the end, all three finalists for “Culinary Student of the Year” were selected as award winners. In discussing the event Stephanie noted, “It was a wonderful experience. Chef Miller, Chef Breckoff, and Dean David Barrish were all in attendance. I was lucky enough to meet Chef Paul Elbling for whom the awards are named, which was quite an honor. I also had the opportunity to prepare and serve a dish at the “Heart of Glass” reception since JSRCC was one of the organizations contracted to cater the event.” Congratulations Stephanie!